Ice climbing Trip, as the word indicates, is the activity of ascending inclined ice formations. Usually, ice climbing refers to roped and protected climbing of features such as ice falls, frozen waterfalls, and cliffs and rock slabs covered with ice refrozen from flows of water. If you provide Alpine ice climbing, Alpine ice is found in a mountain environment, usually requires an approach to reach, and is often climbed in an attempt to summit a mountain. Most alpine ice is generally one component of a longer route and often less technically, having more in common with standard glacier travel. Ice can be soft, hard, brittle or tough. Ice climbing is combined with long or short trekking, peak climbing or expedition as well. Many tourist acclimatization or learns climb ice before climb High Mountain. Our professional staff teaches you all the ice climbing rules if you are a beginner. Asian Hiking Team itinerary begins trekking in Chhukum valley where is possible the lodge and day trip to ice climb, before trekking in calcium valley bring to to Everest Base Camp. Itinerary subject to change as interest, time frame and budget. Equipment: Personal climbing equipment not includes. Highlight of trip: Sherpa people and their hospitability, world height mountain Mt. Everest, view from Kalapatter, Everest Base Camp trekking, beautiful ice climb. Day 01: Fly to Lukla trek to Phagding 2640m 3.30 hours. Day 02: Trek to Namche Bazaar 3440m 5.30 hours. Day 03: Acclimatization rest in Namche. Day 04: Trek to Tyangboche 3867m 5 hours. Day 05: Trek to Dingboche 4410m 5 hours. Day 07: Trek to EBC and overnight in Gorep-shep 5170m, 7/8 hours. Day 08: Trek to Chhukung 4730m 3 hours. Day 09: Full day Ice climbing. Day 10: Trek to Pongboche 4100m 5 hours. Day 11: Trek to Namche 3440m 6 hours. Day 12: Trek to Lukla 2840m 6 hours. Note: it is possible to do Everest base camp combine with ice climbing with 2 days more. The itinerary can be customizing as your schedule and interest. Climbing Equipment such as ropes, Harnes, Cramponse, Carabineers etc. To cross the west bank (right) of the Dudh koshi river, Continue through blue pine and rhododendron forests, pass a settlement if Metal worker (Tok Tok), village of Banker (2905m) with small lodge, see view of Mt. Thamserko (6856m) 1 hr. In the short while cross to the east (left) bank and climb up through Chumowa, cross the Khansar Khola to reach Monzo (2835m). 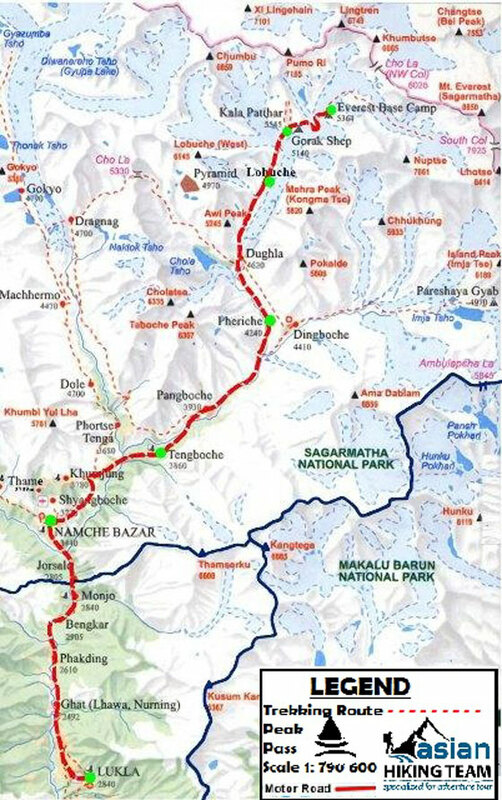 Enter Sagarmatha national park here, 45 minutes from Banker. Descend in a cleft to the west (right) bank of Dudh Kosi on a suspension bridge to reach Jorsule (2774m) 30 minutes. Today we have early lunch at 11 O’clock. This is last village before Namche. After lunch proceed to cross Dudh Kosi (Bhote Kosi) again to the left side & again to cross the main Dudh Kosi, climb up till to Namche Bazaar (3440m), proceed in pine forest. We can see first view of Mt. Everest between Lhotse & Nuptse on the way to Namche. It takes 2 and half hours from Jorsule. Day 06: Trek to Lobuche - 4-5 hours trekking. After breakfast, we start trekking climb the ride the hill. Over the hill with beautiful view of Tawache, Cholatse, Amadablam, Makalu, Island peak. Trek continues to Dukla 4680m, may we have lunch and climb to Dukla/Dhukla pass 4800m where many memorials monuments who died in Everest summit. It takes 5 hours to Lobuche 4910m, Overnight lodge. Day 07: Gorap-shep - EBC - 5/6 hours Trekking to EBC. Early in the morning leaving Lobuche, after lunch in Gorap-shep within 3 hours we will head up to Everest Base camp (5365 meters), and return to Gorak-shep at elevation of 5180 meters at noon for overnight stay. We walk over the moving stone with jump so it does hard, be careful to walk, vernight at Guesthouse with breakfast, lunch and dinner with hot drinks. Day 08: Chhukum – 2 hours Kalapattar climb and 5/7 hours trekking. After reaching Base camp of Everest our aim today is to trek Kalapattar (5545 meters). We start early morning before sunrise to reach the viewpoint that offers some of the best views of Mount Everest as well as other panoramas of the surrounding mountains. Kalapattar means “Black rock”, most excellent view point in the world. Returning to Hotel, after late breakfast descend to Dingboche 5 hours and gradually climbs to Chhukum (4730m) 3.30 hours. We have lunch in Dingboche then after climb to Chhukum 3 hours. Overnight Lodge. After breakfast we will take you to near Ama Dablam north face base camp 2 hours walk. After your arrival our guide briefing and fix the rope. We will teach you till to evening. We will bring pack lunch today. Overnight Chhukum. Day 13: Fly to Kathmandu, sightseeing. Early morning fly to Kathmandu, we will take breakfast in Lukla, transfer to hotel in Kathmandu, sightseeing in Kathmandu or you own activities. Overnight in Kathmandu.